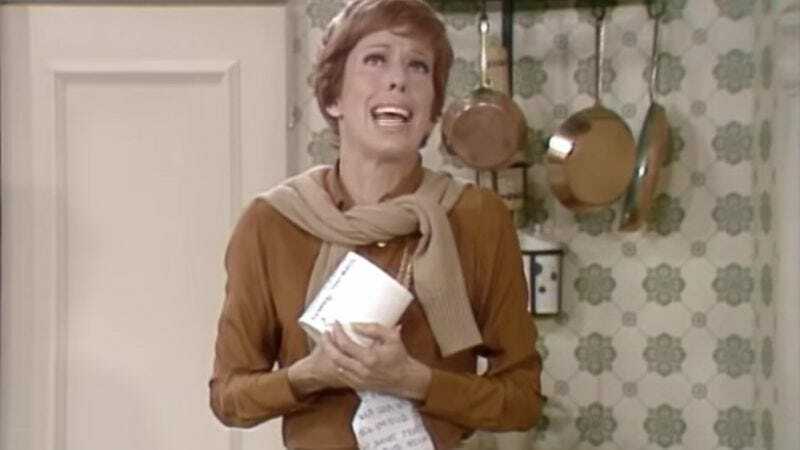 It’s been nearly 40 years since The Carol Burnett Show went off the air—in that time, various compilations of episodes (including an “ultimate” one) have been released for fans to add to their collections, as well as introduce new generations to Burnett’s sketch comedy. Now there’s an official Carol Burnett Show YouTube channel, and The A.V. Club has an exclusive clip from one of the series’ lost episodes. Burnett plays a housewife dealing with harsh realities caused by her choice of toilet paper: Her children, husband, neighbors, and canned-vegetable spokesman (the Green Giant) express their displeasure with the bathroom tissue’s sandpaper-like qualities. It’s an effective send-up of a bygone era of advertising that hawked household products as a kind of guarantee for domestic bliss. As she bemoans her increasingly empty home, you half expect an announcer’s voice to pipe in and tell her she can win them all back with a roll of two-ply. Clips like this and more are available on Time Life’s The Carol Burnett Show: The Lost Episodes DVD collection, as well as the show’s YouTube channel.